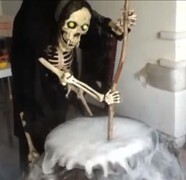 Since the launch of HauntersList the number one most often searched for item that has resulted in a hit to our site has been the Cauldron Creep tutorial by the Devil’s Workshop. I would surmise from this that just about everyone is planning on building one this year, and if that’s the case, you may want to take a look at this cool looking Cauldron Vampire Creep tutorial from Docmansound1. It’s inspired by the original Cauldron Creep by the Devil’s Workshop, and while there’s not much difference between the two (other than some cool looking vampire teeth), the tutorial is a little more detailed on this one.